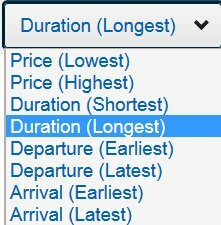 Longest duration? If you find that the direct route is too short, you can always add a stop in Vladivostok. Under a few basic assumptions it has to be a theorem that, given any itinerary from A to B, there exists a longer itinerary from A to B. Experiments with the site suggest, however, that the result of selecting that option is (regrettably from a theoretical perspective, but perhaps preferably for travelers) finite.